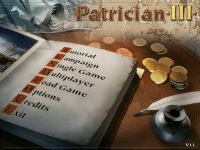 Patrician III: Rise of the Hanse is the latest computer game from Ascaron in their Patrician series. It is a game simulating trading, piracy, politics, and economy. The series was originally released in German, as Patrizier and Patrizier 2. Patrizier 2 had an add on release called Patrizier 2: Aufschwung der Hanse. Patrician 3 is the international release in English of the combined Patrizier 2 and its expansion. The German version was released in 2000 and the English version in 2003. The Patrician series will be continued in Autumn 2010 with The Patrician IV, since Kalypso Media bought the licenses from the insolvent Ascaron company.